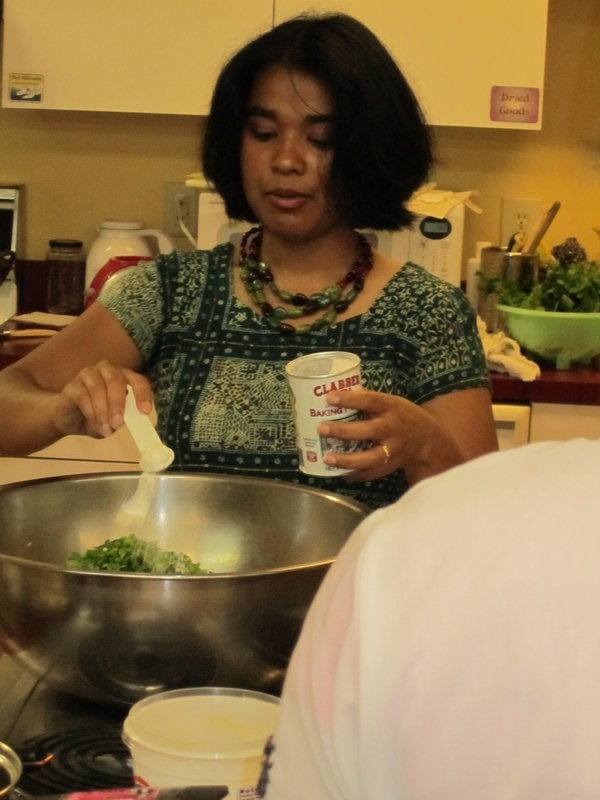 Local chef from Bangladesh Christina Reimer led participants through the Corvallis Wednesday Farmers’ Market to discuss how to use seasonal vegetables in South Asian cooking. Participants then proceeded to the First Alternative Co-op, where they met Chef Christina for a walk through the Co-op to learn where to find some of the vegetables, pulses and spices they would need to prepare the vegetable and pulse-based curries. Participants learned that the Co-op carries many vegetables and fruits from local farmers, at prices similar to those at the farmers’ market. The 15 participants then proceeded to the Co-op’s community kitchen, where they were greeted with mango lassis (a delicious mango and buttermilk drink.) Chef Christina then demonstrated how to cook a delicious meal of special vegetarian Bengali foods: pakoras (fritters), vegetable curry, rice, mint-cilantro chutney, and tomato and cucumber salad with mustard oil dressing. Recipes appear below. A special bonus recipe included below is Orange Cardamom cake. After cooking the meal, participants sat down and devoured the pakoras, vegetable curry, dal, tomato and cucumber salad, and chutney, with rice. Delicious! 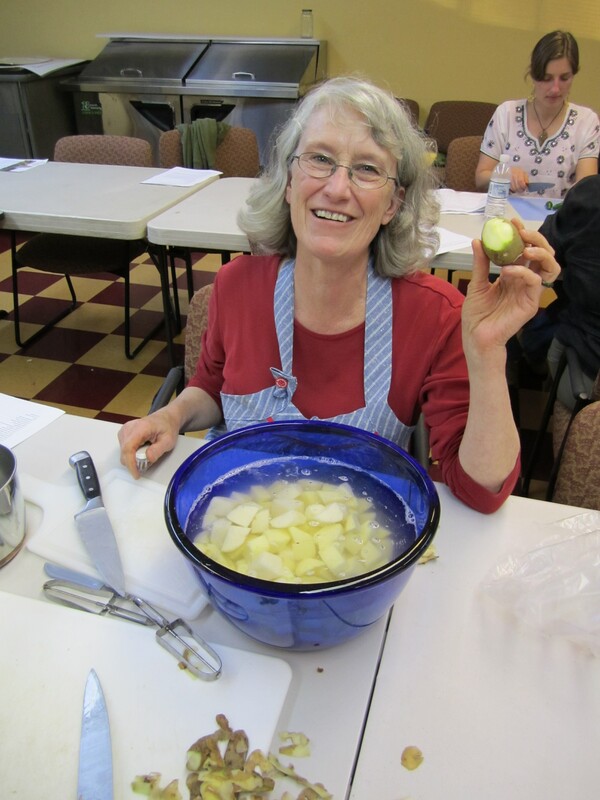 Everyone clamored for another cooking lesson, and Slow Food Corvallis and the Co-op have discussed a repeat with different recipes. In a bowl, mix together the flour, chilli, turmeric, baking powder, asafoetida and salt to taste. Add the seeds, onion, green chillies, fresh cilantro and toss together well. Very gradually mix in enough cold water to make a thick batter surrounding all the ingredients. Heat enough oil in a wok (karahi) for deep-frying. Drop spoonfuls of the mixture into the hot oil and fry until they are golden brown. Leave enough space to turn the pakoras. Drain well on paper towels and serve hot with the mint chutney for dipping. This recipe was adapted from an Indian cookbook by Shehzad Husain and Rafi Fernandez, published in 2002. *Asafeotida known as food of gods, stinking gum, devils dung. It has a pungent smell when raw, but in cooked dishes, it delivers a smooth flavor, reminiscent of leeks. Asafeotida is used as a digestive aid, in food as a condiment and in pickles. Asafoetida is so strong that it must be stored in an airtight container, otherwise the smell will contaminate other spices stored nearby. However, its smell and flavor become much milder and more pleasant upon heating in oil or ghee. This recipe, for the most popular chutney in South Asia, is adapted from Indian food blogger Monica Bhide. It’s from her fusion cookbook Modern Spice. Note: Green chutneys have a short shelf life. Make them fresh in small batches or buy the store-bought kind at Devi in Corvallis. 1. Blend the cilantro, mint, chilli, onion, pomegranate seeds (if using), lemon juice, and salt in a blender to a smooth paste. To aid in the blending process, you can add up to 2 tablespoons of water, if needed. Taste and add more salt if needed. 2. Transfer to a covered container and chill for about 30 minutes. 3. Serve cool. This chutney will keep, refrigerated, for 4 days. Place the lentils, water, turmeric and salt in a pan (medium heat). Cover and bring it to a boil (make sure to keep an eye on it; it boils over easily). Add the veggies (potatoes and carrots first since they take longer then zucchini) and tomato. Cover and cook for about 10 to 15 min till the veggies are tender. In a separate wok or frying pan heat the oil till very hot and the onions, fry till golden brown. Add the oil and onion to the lentils mixture. Add the cilantro. Check to see if more salt is needed. If the soup is too thick add in more water and bring it to gentle boil before serving. Puree the garlic, ginger, tomato, tomato paste and cumin seeds in a blender. Set aside. Heat the oil in a cooking pot and fry the onion paste till lightly colored. Add the chili powder, coriander, turmeric, cumin and garam masala powder. Stir continuously for 1/2 a min to a min. Add 1/4 cup water and stir well. Saute for a min and two. Add the tomato mixture and saute for 2-3 min. Add the veggies and 1 1/2 tsp salt. Saute for couple of minutes and add 3 to 4 cups of water. Cover and boil till veggies are tender. Add the vinegar and boil for 5 more min. Stir in the cream last. Cook for another 5 min. Check to see more salt is needed. Serve warm over rice. Put all the ingredients in a medium size bowl and toss it together with a spoon. Check to see if more salt is needed. Preheat oven to 350 and generously grease twelve one-cup capacity non-stick muffin tins. In a large bowl combine flour baking powder, baking soda and cardamom. Set aside. Using an electric mixer, cream butter, sugar and orange zest together until light and fluffy. Add eggs and yogurt and mix on low speed until ingredients are well combined, then fold flour mixture by hand. Do not over mix. Divide batter evenly among the muffin tins, and bake for 15 to 18 min. Meanwhile, whisk together fresh orange juice, marmalade, boiling water and extra 2 tbs sugar. When orange cakes are ready (test with a toothpick) remove muffin tins from the oven and spoon orange sauce over cakes. Meanwhile, make the sauce. Mix together sugar and water and sir until sugar has dissolved. Raise heat and boil vigorously, washing down sides of pan with a pastry brush dipped in cold water. Continue boiling until syrup turns a rich, deep gold then remove pan from heat. Carefully add orange juice to syrup (be careful because it will splatter). Swirl pan to dissolve juice, returning pan to heat if necessary. Once mixture is smooth, remove from heat and set aside to cool. When cool, whisk in the cream then chill. To serve, turn out cakes and place each on a plate. Heap orange segments on top of cakes, then spoon sauce all around. Note: When you buy mango at a store, look for the smaller, yellow-skinned mangoes, which have a more pronounced flavor. Puree mango with sugar in a blender until smooth. Add buttermilk and blend well. Serve lassi over ice in tall glasses. Note: Lassi can be made 6 hours ahead and chilled, covered.